Consider a case of the single conductor being placed in the magnetic field and carrying current in the same direction due to motor action. This conductors experiences force and conductor starts moving or rotating. When then armature winding of dc motor starts rotating in the magnetic flux produced by field winding, cuts the lines of magnetic flux. 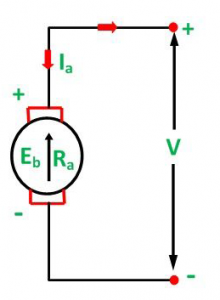 Hence according to faradays’ low of electromagnetic induction, there will be armature supply voltage. Hence this emf is called back emf and it is denoted by E.
Let DC voltage applied to armature be volts with armature resistance be Ra than the equivalent circuit including back emf. Back EMF is a good and necessary phenomenon that makes running of motors possible, it assumes menacing proportions in the operation of relays and solenoids. When the switch is opened, the current from the battery stops flowing instantly. However, the energy in the relay or solenoid “opposes the original change in magnetic flux”, which is now trying to collapse. 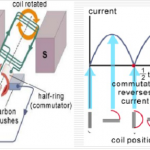 Why is single phase induction motor not self-starting?